What is Homestead Tax Exemption? Potentially reduces the amount of property taxes owed on the property. Exemption may extend to the home and up to 20 acres of land used for a purpose related to the residential use of the homestead. Different taxing entities give different exemptions, depending upon the type of taxing entity and location. Download the application form from your appraisal district’s website--it is free to apply! Note: You must occupy the property by January 1, 2019 to apply. Complete the form and attach copies of your Driver’s License. Note: The address listed on your Driver’s License must match the address of the homestead. Check with your local tax appraisal district for further information and requirements before submission. Return the form to the Appraisal District by April 30, 2019. The homestead exemption will remain in place as long as the owners occupy the property as their homestead. If the owners sell the property or no longer occupy the homestead, they should request a removal of the exemption. Failure to do so may result in the assessment of penalties and interest on the portion of taxes that should not have been exempted. 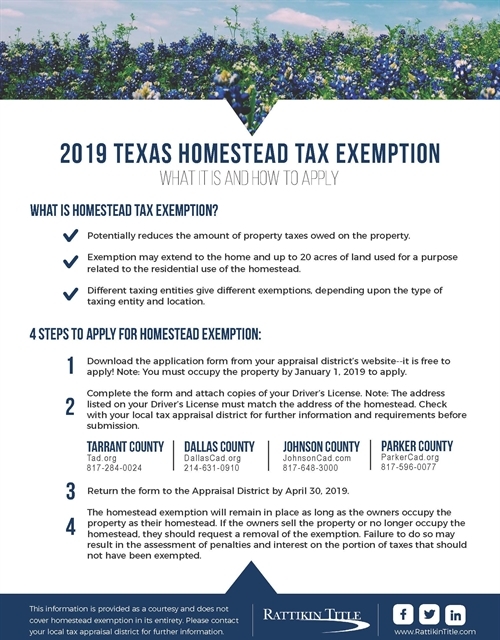 This information is provided as a courtesy and does not cover homestead exemption in its entirety. Please contact your local tax appraisal district for further information.